After a string of flops, Shahid Kapoor hopes for success in his latest film, Phata Poster Nikhla Hero. The actor claims he's never done a comedy role like this before, and hopes the new film will give his career a positive spin. 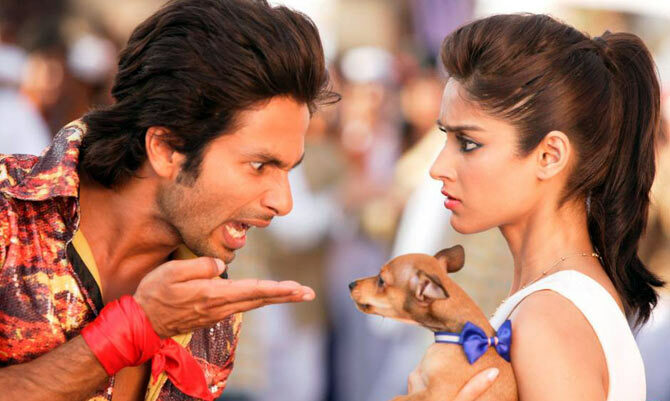 In this interview with Patcy N, Shahid looks back at his career mistakes, and tells us what a 'chilled out' heroine his co-star Ileana D'Cruz is. You haven’t had a hit in a while now. What do you think is going wrong? If your time is right, almost every decision you make seems to go right. If the time is not right, all decisions that you make won’t be right. Once you have taken a decision, you have to stand by it. I will always do that for all the films that I do regardless of the final outcome. I also think I have done less work. It’s something I need to focus on. I want to work with directors whom I can completely submit myself to. Working with Rajji (Santoshi, director) on Phata Poster Nikhla Hero and Prabhu sir (Prabhudheva, director of Shahid’s forthcoming film Rambo Rajkumar) now, and Vishal sir (Bhardwaj, whose directing an adaptation of Shakespeare’s Hamlet) after that... these are the filmmakers that I can blindly trust and follow. That is very important for any actor -- to work with directors that he can submit himself too. What do you do to submit to the director? The script is just words on paper and you cannot have a relationship with words on paper, they need to be converted into a movie. It is important to be on the same page with the entire team. As an actor you have to make an effort to build an equation with the people that you work with. You need to take steps to make the team invest in you and you need to invest in the team. People are more important than words on paper. What was the most challenging thing you did for this movie? This genre is new to me. I have never done an out-and-out comedy character. The songs are very tapori style. Dialogues are also very entertaining. So this zone is different for me. It is a bright, colourful, in-your-face film. I haven’t done a film like that. Rajji is a good actor himself and the perfect person for me because I could follow him. He helped me loosen up and opened me up as an actor and allowed me to go out there and just have fun. You play Salman Khan’s fan in the film. How did you tackle the role? It was not difficult. We are all Salman Khan’s fans. Our whole generation is fans of all the three Khans. We all have bunked college and school to watch their films. I have seen lots of hysterical fans in my life and enjoyed playing one. Is choosing Phata Poster… a good decision after the spate of flops? Phata Poster is the result of Rajkumar Santoshi’s vision. It has nothing to do with my contribution. I have followed his vision in the film. My own journey has been a learning experience. They are helping me in my journey as an actor. But I cannot take credit for the film. After Jab We Met, you said you will be ultra choosy about the films you do. A year later you signed Kaminey. Did being ultra choosy work against you? Sometimes it works in your favour and sometimes it doesn’t. After Vivaah, I took six months off and did Jab We Met. It was a super hit so I thought being choosy really works. But it didn’t work in my next two films. The more time I spend in the industry the more I understand that it is important that you shouldn’t take yourself too seriously. An actor needs to be like clay; he needs to allow other people to mould him, instead of trying to mould himself because then he will be limiting his potential. If other people mould him then there will be variety as everybody will see him differently. If after days of shooting a film you realise that the film is not going the right way, is it difficult to finish the film? I think an actor should just go out there and work every day without worrying about the result. Let other people worry about the result. While making a movie you have to go out there and have lots of fun, believe in it, and back it. If you want to make corrections, you can make corrections later. But while you are shooting that film, the actor of the film has to go out there and be positive. Sometimes, when you believe in a film, even a film that is just okay becomes good. Because you have given it the right energy. That is because they couldn’t get permission to tear any other poster so they had to use their own film’s poster (the poster of Azab Prem Ki Gazab Kahani). There is no other reason for it. You say you have to trust and submit to your director. Have you ever not trusted your directors and who are they? Yes, there have been times in the past where I didn’t open myself up completely to my director. I will never tell you who the directors were and which films till my dying day (laughs). What do you think of your co-star Illeana D’cruz? Illeana is sometimes shy and sometimes very talkative. Overall, she is very chilled out. Since the film is largely comedy, every day on the sets was laughter and fun. Illeana fitted into the space very easily because she has done a lot of south films that are full-on entertainers. I had not seen her work so when I googled her, the first thing I saw was her belly dancing song. I thought she was too cool. She has done some fun stuff down south. What about Raj Kumar Santoshi? There is something about Rajji that I want to say. On a day when we are shooting an emotional scene, when you reach the sets, everything is quiet. He will be sitting with moist eyes and a sad expression. If you are not in the mood of the scene, you will feel guilty that you have not invested in the scene like the rest of the team. But if there is scene where you have to do masti and fun, he will be cracking jokes with his unit members and when you walk in he will crack a joke with you. He creates the mood on the sets. He makes sure you are in character as soon as you walk onto the sets. When Emraan Hashmi dropped out of Milan Talkies, you signed up for the film. Are you okay doing it? You know how many people were approached for Lagaan? Do you think it was a mistake that Aamir Khan did it? You should do a film because you believe in it. It is egoistic to think that they did not approach me first. It is important to take the right decision and do the right films. That is the priority. If I like a film and I like the filmmaker, I will work with them.